Renovations were recently carried out at the biggest baseball stadium in Cuba, the Estadio Latinoamericano, Latin-American Stadium, also known as the Coloso del Cerro or Colossus of the Hill. Residents of the Havana neighborhood that houses the stadium said they were merely “cosmetic fixes.” And only blocks away, damaged structures are part of the landscape. Not a rare sighting in Cuba. Havana spruced up for the visit of President Barack Obama. The excitement ahead of the historical moment was palpable. Sightings of American flags and people clad in red, white and blue were common. Opposition leaders, however, said expectations needed to be toned down. Obama is a huge star in Cuba. Eighty percent of Cubans think favorably of the U.S. president, according to a poll by Bendixen and Amandi International. That makes him almost twice as popular as President Raul Castro, who enjoys a 47 percent favorable view, according to the same survey. Manuel Cuesta Morua, leader of the organization Progressive Spectrum in Cuba, flat out said Obama is Cuba’s most popular politician. Cuesta Morua told VOA people from all over the island prepared to travel to Havana just to try to get a glimpse of the president. He said Cubans in Camagüey, a city in central Cuba,rented camiones or big trucks to drive to the capital. 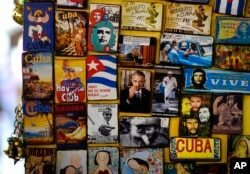 Refrigerator magnets are displayed for sale in a tourist shop, several showing images of U.S. President Barack Obama, at a market in Havana, Cuba, March 14, 2016. Obama will travel to Cuba on March 20. With the majority of Cubans making a little less than $20 a month, renting a vehicle is a big expense. The Cuban government is aware of Obama’s popularity. Many in the island think, Castro has changed the way he interacts with people because of it, even if only slightly. “It had been years since President Raul Castro had been in the streets. Not too long ago he walked around the streets of Santiago. I think he was trying to push proselytism, trying, indeed, to project a closer image to the people and to copy that Western style and above all, Obama’s style of being in public and greeting people,” said Avila. But despite Obama’s huge popularity on the island and days before his historic visit after ending five decades of hostility, dissidents said not much has changed in Cuba since the relations were reestablished on December 17, 2014. One of the factors that remains untouched is the Cuban government’s crackdown against the opposition. According to more than a dozen dissidents interviewed by VOA in the last month, arbitrary political detentions have seen a rise since the diplomatic reset. “It is true that the repression has increased. But it has increased, towards the civil society actors and the society itself, because society is making more demands. The society is changing,” said Cuesta Morua. Other dissidents echoed that sentiment. “I think this shows more than an increase of the government’s repression. I think it is a signal of the surge of the opposition and the state of inconformity of the Cubans, mainly the pro-democracy Cubans,” said Celaya. 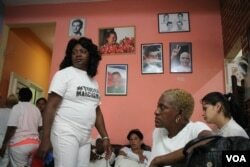 She added that Cubans are discontent with an increasing deterioration of their everyday lives. The cost of living gets higher and higher, there is more unemployment and there is more hopelessness overall, she said. Many Cubans have hurried to leave the island soon after the reestablishment of diplomatic ties was announced fearing a change in the Cuban Adjustment Act, a U.S. immigration program that allows Cuban citizens to stay in American territory after they have been in the country for more than a year. Hours before U.S. President Barack Obama arrives, policewomen drag away a member of Ladies in White, a women's dissident group that calls for the release of political prisoners, during their weekly protest in Havana, Cuba, March 20, 2016. He also stated that today people are more willing to listen to opposition messaging. He told VOA that 10 years ago, people would run away or dodge an opposition activist due to fear of retaliation from authorities. “People used to be very protective. People were aware of the person next to them in a bus or someone at a market that you didn’t know. People restrained from expressing their opinion because it could have been watched by an eye of the Big Brother policing each of the commentaries and each step,” said Cuesta Morua. Dissidents also told VOA the changes happened because Cubans can now see, according to them, right through the government. “The people see a distant government. It is not a government for the people but against the people,” said Cuesta. That is one of the reasons President Obama’s visit is, for many, bittersweet.